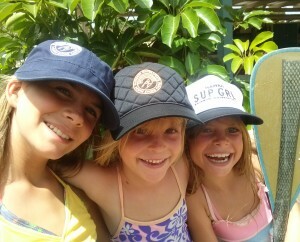 Get Some North Shore Style Stand Up Paddle Hats! Our New Hats our flying out of our Rainbow Van on to people’s heads faster than you can say “SUP? !” Our favorite rainbow-colored logo’d hats are now accompanied by our new hat with the design by our friends at North Shore Embroidery (http://www.northshoreembroidery.com/)! We now have lots of hats for Mom, Dad, the kids, and all our paddling friends! Not only are they designed differently, but the shape of these hats are more stylish than you have ever seen. Want to see your friends green with envy? Oh just kidding, want to share these wonderful hats with your friends?